Well so I was very nervous. I managed to do one last run through for both songs; Heat Haze and Fiddle Time before leaving home to Yamaha. Couldn't perform the Titanium duet I planned with Tita as the Yamaha people said they need to cut the time short. And because of that also I have to play solo, without any music. Kosong gesek-gesek saja... Honestly I love to play Fiddle Time along with the music coz it sounded more funky and fun. But their over encouraging words made me trust myself to play solo. As in realllllly solo. I was informed that there would be another violist, a young girl. I was really hoping to see her. Well okay honestly not really. 50-50. I wanted to see other people play violin but at the same time the thought of a small girl might be playing better than me got me a bit anxious. Found a seat next to two teenage girls. The first few minutes I was asked my age already. The girls are 17 and 19. Ah man, reality creeps I'm not a teenager anymore. Oh and they asked what song am I playing. They were playing Talking To The Moon and Everything Has Changed. Oh. Cool. Sooo cool....! I was a bit psyched at the perception that textbook songs are not cool. But felt better after explaining to them about my violin because it made me realize every instrument is different and unique. And I trust my teacher that I do better solo. I soon found out I was the only violinist. I was the third to perform (my mum and younger brother told me after the concert. Was too busy chatting I guess) in which at that moment my reaction was "What?! Me?! So soon?!!!" Really. 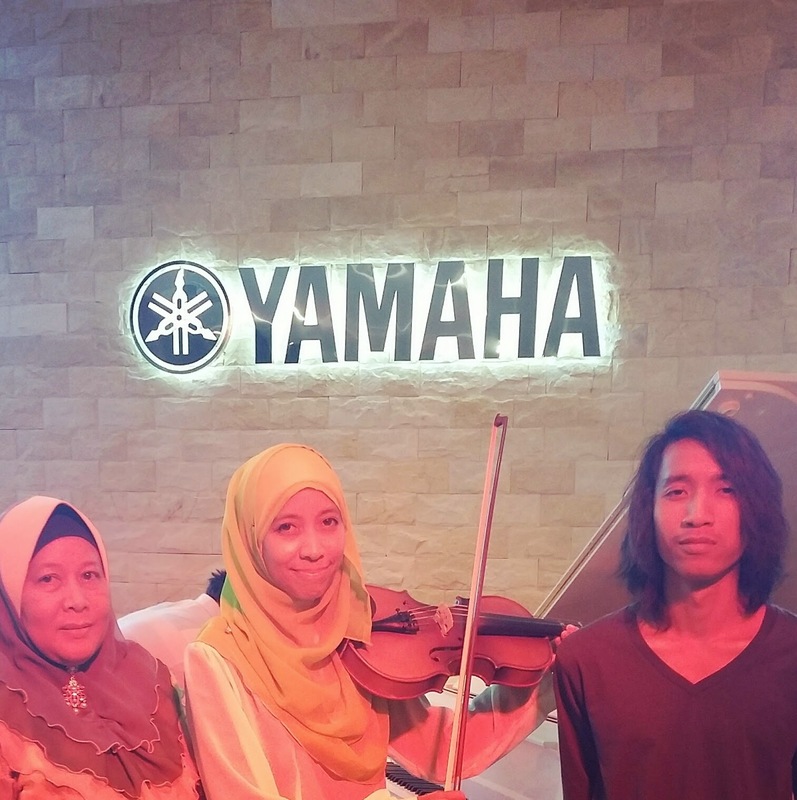 The Yamaha girl (aduh I didn't know her name...) called out "Violin prepare after this okay!" While doing gestures instructing me to take out my violin. Like what.... -_-" @_@ Seriously, seriously???? Walked to the front row. Took a seat and searched for familiar faces. Saw Am first, then Meen, and my mum. Couldn't find Iz then I found him. Sitting next to my mum. He waved. Seeing him sitting next to my mum. Aww... Just like a family. Feel blessed. Took out my violin and I heard the little girl next to me gasped in awe. Seriously! Go up on stage first thing I noticed. I forgot to step on the stage with my right foot! Melangkah kaki kiri... And I felt bad already. And because of that before starting rasa oh so nervous baca bismillah banyak-banyak. Baca bismillah banyak-banyak and I remembered my teacher told me to count 1, 2, 3, 4 then start. So I took quite some time there. And I played a short G to test. Okay. With that sound I heard gushes and whispers. Bunyi G memang sedap I know. G String. Eheh. I was really nervous! Like sangat..........! I was shaking like mad while waiting for my turn. And even stroking that G string also needs a lot of guts. "One more time. One more time"
Okay.... Let's give another round of applause. One more time! But still it didn't went as smooth as I hoped. Uwaaa....! And Chairin, Tita, and Meen got it all on camera. Recorded. Oh yeah. I watched the video back at home. Eee yuckkkk! Even I shrieked at the screeching violin!